Posted: Tue Mar 10, 2009 12:44 am Post subject: North Korea Goes "Bang" under Kim Jong Un? The USA and South Korea launched their large-scale joint military exercise on the south of the Korean Peninsula. North Korea qualified the event as war preparations and set its army on full alert. Over 26,000 US military men participate in the Key Resolve and Foal Eagle military drills. Over 12,000 of them were assigned from the US military contingent in the south of the Korean Peninsula; the rest arrived from abroad. South Korea provided several tens of thousands of servicemen for the drill. Nuclear-powered aircraft John C. Stennis and other navy ships will participate in the exercise. The allied command informed North Korea about the time of the maneuvers that would end on March 20, as well as about the defensive nature of the drills that were held to strengthen the combat readiness of the troops. In the meantime, North Korean officials described the drills between the United States and South Korea as a disguised events the goal of which was to prepare for an aggression. North Korea is currently working on the launch of its Kwangmyungsung-2 satellite, although experts say that the nation is going to test a ballistic missile that could be capable of reaching the US territory. Korea is the place predicted for the flashpoint of the next world war. * Prelude - The events leading up to the start of World War Three, including Sept 11, 2001. * Act 1 - The Middle East. Widespread conflict to bring the entire region into the flames of war, possibly triggered by Iran or militants in Pakistan using North Korean supplied nuclear arms. The first Scene in this Act is the US Invasion of Iraq on March 20, 2003. * Act 2 - Israel at War -- Against her Arab neighbors, possibly Palestine. A Palestinian State will be established, so that all Israelis will be fully separated from Palestinians (listen out for mention of a 7-year treaty to be confirmed by a World Leader - probably Bush), only for Israel to viciously attack Palestine shortly thereafter. * Act 3 - Far East -- "Hair-raising nuclear confrontation that threatens mankind's existence" - Peter Lemesurier, author of The Armageddon Script, p. 223, written in 1981. Includes China invading Taiwan and a nuclear eruption on the Korean Peninsula. * Act 4 - Erosion of Confidence in 'The System' so severe citizens will be panicked into giving up liberties and Constitutional form of government. The plan calls for the dissolution of the US Constitution, triggered by a significant enough 'terrorist' attack. The ultimate intent is to introduce a global government and one-world religion. * Act 5 - The collapse of the US, and other Western economies and morals. * Act 6 - Significant population reduction using natural and man-made disasters. * Curtain. Who can tell how this war will end? What economy? What morals? All is illusion since the 'moneylenders moved back into the temple'. The dramatic increase of divorce undermined the institution of the family. The imposition of higher taxes undermined the economic stability and vitality of the Empire. Taxes were raised to pay for deficit government spending, to pay for food for all in society and to pay for government-sponsored activities of diversion, such as circuses and sports. Interestingly, as the time of the final collapse drew closer, greater emphasis was placed on sports, to divert the attention of the public from the distressing news of massive trouble within the Empire. The drive for personal pleasure had become very intense, even to the point of obsession. Gibbons noted that, at the very end, sports had become more exciting and brutal. People lost their faith, both religiously and in their government. Paganism gave way to Christianity and the efficient Roman Government gave way to chaos and disintegration. Hidden conspirators were working within the government to secretly destroy it. They worked quietly, invisibly and deceitfully; during the entire time they were secretly dismantling the government of the Roman Empire, they publicly proclaimed their unswerving support of it. Recognize any of the above 5 points occurring in Western societies today? How many know that Washington starved the N.Korean Millions not Kim Yong Il? Apparently by freezing a shipment of Rice. Sound familiar to Iraq Sactions anyone? Go check it out! Pyonyang was already facing internationals after the nuclear test at the weekend but this unequivocal act of war is being seen as a major escalation in the North's international relations. The threat is thought to have been provoked after Seoul joined a US-led initiative to check vessels suspected of carrying nuclear equipment. A North Korean army spokesman also said the country was not obliged to maintain the armistice signed at the end of the 1950-53 Korean War because Washington had ignored its responsibility as a signatory by drawing South Korea into its naval initiative. The threat comes after South Korean media reported that Pyongyang had restarted the Yongbyon plant that makes weapons-grade plutonium. A spokesman for the North's army said: "Any hostile act against our peaceful vessels including search and seizure will be considered an unpardonable infringement on our sovereignty and we will immediately respond with a powerful military strike." South Korea had confirmed it was joining the naval exercise, called the Proliferation Security Initiative. Pyongyang also appeared to have fired a third short-range missile after it added to tensions with a launch of two others. The US, NATO and Israelis expansionist war crimes have created a global Strategy Of Tension. They are rubbing their hands and waiting for the first independent nation to punch them back. Take deep breath; hold nose; jump in...? U.S. Nuclear first strike "likely"
Washington, DC (TRN) -- North Korea yesterday withdrew from the Armistice that halted the Korean War. Today, official Washington is abuzz with not so secret "Top Secret" plans for the United States to make a limited nuclear first strike to wipe out the North Korean threat in one fell swoop. Russia has been alerted to "make plans" for radiation fallout in its eastern border area. In consultations with China, the U.S. Ambassador to Beijing was said to be stunned when he was told by the Chinese government "Kim Jung Il is out of control and dangerous. He has become a serious liability for China. Do what must be done, but please do it in a manner that minimizes risk to China." China was then briefed about US plans and asked to prepare its southern population areas for radiation fallout. It is expected that prevailing weather patterns will disperse fallout over the sea, causing it to thin out dramatically before moving over land. Our source in the State Department explained today why this situation got so bad, so fast. "The Korean War legally never ended." he said. "There is no peace treaty, there is only an Armistice, a formal cease-fire. When North Korea officially withdrew from the Armistice yesterday, it automatically brought us back into a hot war. "he continued. "Of all the scenarios involving North Korea, withdrawing from the Armistice was the one thing we thought they never would do. Since the War, everyone has known that withdrawing from the Armistice means the cease-fire is over. Today, that cease fire is over; we are back at war with North Korea and this time, the outcome will not be negotiated. Withdrawing from the Armistice was the last mistake North Korea will ever make. Their leadership must surrender now or they are nothing more than dead men walking. It's over for them" he finished. Pentagon: Nuclear first strike "Likely"
Early in the evening on Tuesday, President Barack Obama gave permission for the US Military to airlift "Patriot Missile Air Defense" systems to South Korea and additional units to bolster 16 systems already in Japan. Those systems were airborne hours later and arrived in South Korea and Japan today. The model of Patriot Missile systems sent is "PAC-3" and they were accompanied by M-901 control stations and AN/MPQ-53 phased array radar. Sources with acute knowledge of the plans for North Korea have confirmed to TRN that a US nuclear first strike is going to be launched. The first strike will be carried out through submarine-launched, BGM-109 Tomahawk cruise missiles, model TLAM/A whose explosive payload can be "dialed" to be anywhere from 100 kilotons to one point five megatons nuclear yield per missile. There will be no warning. North Korea will not be able to track the incoming cruise missiles via radar. The only way they will know the attack is taking place is when they see a blinding white flash as the temperature rises to ten thousand degrees and the wind gusts to 650 miles per hour. North Korean troops along the Demilitarized Zone (DMZ) will be hit first to prevent them from invading south Korea. Multiple cruise missiles using Time of Arrival (TOA) control will detonate simultaneously along the DMZ, wiping out over one million North Korean troops in seconds. Minutes later, after the U.S. National Security Agency (NSA) confirms that the North Korean leadership has been told by their own command structure that their troops at the DMZ have all been killed, Kim Jung Il will be contacted and asked if he is willing to surrender. It is expected he will not. At that point, a B-2 Stealth Bomber will be sent in to deliver the final blow. Pyongyang will be hit with a surface detonation of a massive nuclear bomb, wiping out the entire city and the entire government of North Korea. As soon as that surface detonation takes place, several hundred additional cruise missiles carrying conventional payloads and launched from land, air and sea sites, will hit every North Korean military facility in the entire country, instantly crippling their entire command and control system. Carrier based Aircraft will then fly in to clean up whatever resistance remains. It is expected the war will be over within one or two days. Korea will be reunited. It's Capitol will be Seoul and its government will be democratically elected. This difficult decision to make a nuclear first strike was arrived at because the threat of North Korea invading South Korea once hostilities resume was too great a danger to world stability. The world does not need or want another large, lengthy war. The decision to use a nuclear first strike serves another purpose as well: sending a clear message to countries like Pakistan, India and Iran about what they can expect if they continue traveling down the nuclear road. The thinking in Washington, Beijing and Moscow is that the world needs to send this message and there will not be a better reason or better time to send it than now. Is it just me or is there a synchronicity here coupled with ongoing 9/11 & Bilderberg revelations? Seems every time a new nail is driven into 'their' coffin, 'they' respond with further violence and threats thereof. If this is truly the case, 'their' lack of wisdom is indeed terminal. U.S. says North Korea test results "inconclusive"
WASHINGTON (Reuters) – Initial U.S. testing to determine whether North Korea fired a nuclear device on Monday proved "inconclusive," said a U.S. official on Friday. "The first test results came in inconclusive. They did not find anything that could confirm a nuclear device was detonated," said the U.S. official, who declined to be named. Sorry I don't know how to show this on screen! I'll pretend understand what you have just written to me, next time I'll just provide a link, until then i'll spend time hiding in a darkened room with some kind person holding my hand and taking me through all this impressive technology business. I have to agree with Snr Ron though, he is a good thinker. LOL - it's a minefield, for sure. You note my attempt didn't work anyway - this time. A heads up on Hal Turner - apparently he was arrested a couple of days ago. Whether in relation to the above inflammatory claim of pre-emptive strike or not, I don't know - yet. In 1995 Colin Powell said that if the North dared to use its missiles and weapons of mass destruction, the U.S. would turn North Korea into "a charcoal briquette." Anyone following North Korean press may have noticed the country seems to be indulging in some sort of construction boom recently. Kim Jong-un seems to be constantly opening impressive new amusement parks, and recent photos from Pyongyang showed large-scale projects and gleaming towers hitting the skyline. Then, of course, there's the rocket launches, and the rumors of another atomic bomb. In an article over at Asia Times, Leonid A Petrov, a lecturer in Korean studies at the University of Sydney, points out that many experts expected the North Korean state to crumble after the fall of the USSR. Petrov writes that the country's salvation came from its incredible natural resources. The country's mountainous regions are thought to sit on around 200 different minerals, including, crucially, a large number of rare earth metals. The total worth of these deposits is thought to be worth more than $6 trillion*. North Korea may begin to resemble an oil-rich gulf state, using the huge profits from a natural resource to keep in place an inefficient and corrupt state. Kim may have to turn increasingly to other countries with greater technology, such as China, the world's leading expert in rare earth metals, and even South Korea. Incredibly, we're already beginning to see this new North Korea in action, not just newfound government spending, but also in its relationship with other countries. According to the WSJ, South Korea's state-owned commodities developer recently admitted it held talks in North Korea last year about a possible joint-rare earth venture. *CORRECTION: This article originally said that the rare earth metals alone were worth $6 trillion, but the figure in fact refers to all of the mineral deposits. What exactly is North Korea going ballistic about? 'Weather Warfare against "Rogue States"
However, what the news media has failed to underscore is that a number of unusual and dramatic climatic changes have occurred in recent years in countries which are identified as possible targets under the US Administration's pre-emptive war doctrine. Here is former Israeli ambassador Dan Gillerman telling us how North Korea should be 'wiped off the map'. Former Isreali Ambassador: "North Korea Needs To Be Wiped Off the Map" !!!! North Korean leader Kim Jong Un has ordered preparations for launching ISIS-style terror attacks on South Korea, Seoul's spy agency claims. The warning comes as tensions between the rival nations grow after Pyongyang's recent nuclear test and rocket launch. North Korea has a history of attacks on South Korea, such as the 2010 shelling on an island that killed four South Koreans and the 1987 bombing of a South Korean passenger plane that killed all 115 people on board. During the briefing, the NIS said the attacks could target anti-Pyongyang activists, defectors and government officials in South Korea, according to a Saenuri official who was present. Terror attacks on subways, shopping malls and other public places could also happen, he said. The official quoted the NIS as saying North Korea could launch poisoning attacks on the activists and defectors, or lure them to China where they would be kidnapped. The current North Korea stand-off is not expected to calm down soon, as Seoul and Washington are discussing deploying a sophisticated US missile defence system in South Korea that Pyongyang warns would be a source of regional tension. The allies also say their upcoming annual military drills will be the largest ever. The North says the drills are preparation to stage an invasion. The US on Wednesday flew four stealth F-22 fighter jets over South Korea and reaffirmed it maintains an "ironclad commitment" to the defence of its Asian ally. Last month, it sent a nuclear-capable B-52 bomber to South Korea following the North's fourth nuclear test. Foreign analysts say the North's rocket launch and nuclear test put the country further along its quest for a nuclear-armed missile that could reach the US mainland. Meanwhile, top scientists have said that recent nuclear tests carried out by North Korea could trigger a nearby volcano to erupt. Fears: Could a North Korea nuke test trigger a volcanic eruption? Experts from Yonsei University in Seoul claim the pressure caused by a nuclear bomb exploding underground could affect the magma chamber of a volcano – causing an eruption. "An underground nuclear explosion test near an active volcano constitutes a direct threat to the volcano," Hong Tae-kyung, a professor of seismology said. To use the fabrication of a threat from North Korea as a justification for the renewal of Trident – as Theresa May did in the Commons debate on Tuesday night (Report, 19 July) – exposes not only the depths of deception to which the government will sink but its deep ignorance of the reality of North Korea. A similar bone-headedness on the part of our alleged “intelligence services” cannot escape us either. I am no supporter of the North Korean regime. It must be an appalling place to live. However, unlike our government frontbench and the bulk of our MI6 spooks, I have actually been there. Four times. And I can tell you that the DPRK is in no position to threaten anyone, not even its immediate neighbours. It is not ready to “lash out” – a cliche much favoured by lazy western journalists who know nothing about the country and who, of course, have never been there. It is simply not in the interests of North Korea to “lash out”. It has nothing to gain by doing so. Since the end of the Korean war in 1953, North Korea has just wanted to be left alone – to rely on Kim Il-Sung’s founding principle of “Juche”, meaning self-reliance. If the DPRK has seemed at times hostile to the outside world, that is surely understandable when the enduring, slack-witted policy of the US, in particular, has been to poke the DPRK with a sharp stick and then run away. Neither has North Korea got the capability to attack its neighbours, never mind Theresa May and her constituents in Maidenhead. Almost every military vehicle I’ve seen in North Korea, over four visits, has been parked up at the kerb, broken down, with the heads of two teenage DPRK soldiers down inside the engine. The whole country is held together with string and Sellotape. But, in the way of the Stalinist planned economy, this week it will be all string and no Sellotape. Next week, all Sellotape and no string. And on the basis of this bogus threat, the UK government can, somehow, find billions of pounds to renew Trident? Readers will have noticed that there is never, these days, the money to properly fund our schools and hospitals, and provide the elderly with the care and dignity they deserve. But, always, billions are available to the military. To confront a threat that doesn’t actually exist. And even one from a feeble, tragic, cartoon country such as North Korea. A news programme showing how the alleged assassination of Kim Jong Nam took place is shown on a TV screen in Pyeongchang, Gangwon-do, South Korea, on Feb 15, 2017. KUALA LUMPUR - It took no more than five seconds for two assailants said to be North Korean agents to administer what is believed to be poison on Kim Jong Nam, the estranged half brother of North Korean leader Kim Jong Un, at Kuala Lumpur International Airport 2 (KLIA2) on Monday (Feb 13), Malaysian daily New Straits Times reported. Kim, 45, was standing in a small crowd in front of the airport's self-service check-in counter when his purported female assailants struck, the report said. One of them stood in front of him to distract him while the other locked him from behind in a chokehold, and administered the poison that killed him soon after, the report said. It suggested that the operation was captured on the multitude of closed-circuit television (CCTV) cameras positioned strategically throughout the departure hall. 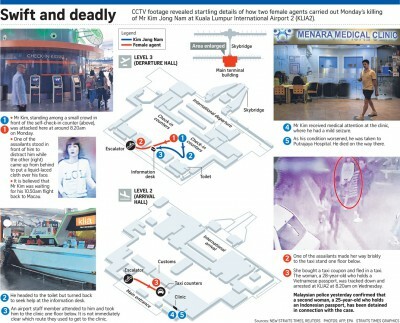 Subsequent movements of the female assassins after the job was carried out were also filmed by the cameras, it said. KUALA LUMPUR/JAKARTA (Reuters) - The woman with the acronym 'LOL' on her shirt who was arrested this week in connection with the murder of North Korea's Kim Jong Nam stayed in cheap hotels, carried a wad of cash and cut her hair a day before the brazen attack at Kuala Lumpur airport. According to the receptionist at one of the hotels, a woman who had checked in under the Vietnamese name of Doan Thi Huong on Sunday (Feb 12) left early in the morning on Monday, the day of the assassination, and returned later, showing no signs of stress. Police believe she was the person who, at around 8.20am that day, had approached the estranged half-brother of North Korean leader Kim Jong Un from behind at the Malaysian capital's budget airline terminal and thrust a deadly poisonous substance into his face. According to Malaysian media reports, Doan told police she had been duped into what she thought was a harmless practical joke. A second woman who has been detained, an Indonesian national, also thought she was involved in a prank, some media reports said. However, staff at two hotels in a rundown area near the airport gave details of Doan's movements before the killing that appeared both calm and deliberate. A private investigator told Reuters her behaviour bore the hallmarks of an intelligence operative. The assassinated half-brother of North Korean leader Kim Jong Un used to enjoy coming to Malaysia but always had bodyguards with him as he feared for his life, says a restaurant owner who knew him. An undated photo of Mr Kim Jong Un inspecting a construction site, released by North Korea's Korean Central News Agency last month. Experts say he may have viewed his brother as a thorn and felt the need to eliminate him. A picture taken in August 1981 at an unknown location showing Kim Jong Nam (front row, right), the half brother of North Korean leader Kim Jong Un, together with his father Kim Jong Il. A man believed to be North Korean heir-apparent Kim Jong Nam emerging from a bus as he is escorted by Japanese authorities upon his deportation from Japan at Tokyo's Narita international airport, on May 4, 2001. Mr Kim Jong Nam and his family reportedly lived in virtual exile in Macau, Singapore and China. Doan went first to the two-star Qlassic Hotel, checking in on Saturday, Feb 11. A staff member who asked not to be named said she stayed in the cheapest room, which had no windows. "I remember she had wanted to extend her stay here, and was ready to pay with a stack of money in her hand," said another member of the Qlassic's staff, a front-desk employee who only identified herself as Sia. After one night, Doan checked into the CityView Hotel, arriving with a suitcase, a backpack and a large teddy bear, the receptionist told Reuters, declining to be named. She said Doan spoke understandable English. She borrowed a pair of scissors from the front desk the evening before the attack, and a member of housekeeping staff found hair on the floor and in the waste basket the next day. "She found the scissors on the room desk. And there was hair strewn on the floor in the room, (Doan) had thrown some in the bin but there was still a mess," the receptionist said. She said that the next day Doan had on the shirt she was seen wearing in an airport CCTV grab that has earned her the nickname "LOL Girl" in Malaysian media. Doan was out for much of the morning and, on her return, she seemed "relaxed" and "didn't look angry or worried". Doan complained about the Wifi in her room and when she was told it couldn't be fixed until the afternoon, she checked out and left. She then checked into the SkyStar Hotel, also nearby, and left after one night, an employee said. It is not known where Doan went next. Police said she was arrested on Wednesday morning, about 48 hours after the murder, in the same terminal where Kim Jong Nam was attacked. "If you ask me, do her movements indicate that she was an intelligence operative, then I would say yes," said a private investigator in Kuala Lumpur who asked not to be named. "That is how they operate. Change of appearance, cash transactions, no paper trail and constantly on the move." The Indonesian woman who was arrested on Thursday, Siti Aisyah, had lived a quiet life in a slum district of Jakarta before going to find work in Malaysia, residents in the western neighbourhood of the Indonesian capital said. According to Malaysian media reports, she stood in front of Kim to distract him while her accomplice approached from behind. In Jakarta, Aisyah had worked for a time in the tailoring business in the house of her ex-husband's family, sewing clothes by hand, former neighbours in the Tambora district said. "I can't believe the news. Her background was very simple,"said community leader R. Yusri. The couple moved to Malaysia several years ago but separated in 2012. Aisyah's former father-in-law said she had returned to Jakarta on Jan 28 to visit her seven-year-old son. She had looked thinner than usual and had a cough. The streets in Tambora district are too narrow for cars to pass through. A tangle of washing lines hangs above small concrete and makeshift homes, many housing small businesses or selling clothes and food. Ida Anisafitri, a neighbour, said Aisyah kept a low profile when she visited there. "We would see her briefly with the child and then she would go back inside the house," Anisafitri said, as a loudspeaker from a nearby mosque sounded with the call to prayer. What happened to the half-brother of Kim Jong Un at Kuala Lumpur International Airport 2? Who has been arrested for the suspected murder? KUALA LUMPUR: On the morning of Feb 13, Kim Jong Nam, the half-brother of North Korean leader Kim Jong Un, was at Malaysia’s low-cost Kuala Lumpur International Airport 2 (KLIA2) and headed for his flight to Macau where he lives in exile. He never made it home. Here is a recap of the alleged assassination and the ensuing fallout. As the portly 46-year-old was walking through the departure hall just after 8am, two women who had been tailing him struck, according to Malaysian police. One of the women allegedly distracted Kim while another grabbed his face from behind and clamped a cloth believed to be soaked in a chemical to it. He was taken to a clinic one floor down from the arrival hall. At that point, he experienced mild seizure and was on the verge of passing out, reports said. An ambulance was called and he was sent to the Putrajaya Hospital close by. “He died on the way to hospital,” a senior police source told ChannelNewsAsia. A day later, South Korean media broke news of the death citing intelligence sources. Early reports allege that he was attacked with poison needles or splashed with an unknown liquid. Malaysian officials would only confirm that a Korean man, carrying travel documents under the name Kim Chol, died on the way to hospital. On Wednesday, Seoul's unification ministry said the South Korean government is confident the "murdered man" was Kim Jong Nam, saying North Korea had been planning to kill him for the past five years. Malaysian police announced the arrest of a woman holding a Vietnamese passport who matched CCTV footage of the alleged attackers. The suspect is identified as 28-year-old Doan Thi Huong. CCTV images of the suspected attackers were published by the media and one of the women reportedly involved is seen sporting a white blouse with "LOL" written in front. An autopsy on the body at Kuala Lumpur Hospital was also completed on Wednesday evening to the objection of North Korea, which wanted the body released immediately for cremation. Malaysia's deputy prime minister confirmed three days after the North Korean man who died was Kim Jong Nam. Deputy Prime Minister Ahmad Zahid Hamidi told the press that Kim Jong Un's half-brother had travelled with a passport with the name “Kim Chol”. Earlier that day 2am, an Indonesian by the name of Siti Aisyah, 25, was arrested. Her boyfriend, Malaysian Muhammad Farid Jalaluddin, 26, was picked up by police as well to assist in investigations. On Friday, Malaysian authorities said they would not release the body of Kim Jong Nam until his family has provided a DNA sample. At about 11.40pm, the North Korean envoy to Malaysia was spotted at Hospital Kuala Lumpur trying to gain access to the National Institute of Forensic Medicine at where Kim Jong Nam’s body is being held. He read out a statement accusing Malaysia of "forcing" a post-mortem on the body and alleged that it was "colluding with hostile forces" by rejecting demands to release the body. In response, Malaysia’s police chief said: "Whilst in Malaysia, everyone has to obey our rules and regulations ...that includes North Korea." Channel NewsAsia spoke to people in the hometown of the Indonesian suspect in Kim Jong Nam's death and is told the woman is "very timid" and very much an "introvert". Kim Jong Nam was the eldest son of North Korea’s late leader Kim Jong-il. Unlike most of his isolated countrymen, he had a cosmopolitan upbringing and was educated at the International School of Geneva and Lycée Français Alexandre Dumas in Moscow. He was considered to be in training as North Korea’s next supreme leader during the 1990s, but fell out of favour with his father after he was caught trying to enter Japan in 2001 on a fake passport to visit Tokyo Disneyland. His birth was considered shameful because his father and mother, actress Sung Hye Rim, were unmarried. He went into exile and was known to be living in Macau from around 2003, but also had relatives, including at least three children with three different women – two wives and one mistress – living in Beijing, according to South Korea’s intelligence service. His travels and good life were documented on a Facebook page under the name "Kim Chol", which some say may have been his undoing. For Americans, the journalist Blaine Harden has written, this bombing was "perhaps the most forgotten part of a forgotten war," even though it was almost certainly "a major war crime." Yet it shows that North Korea's hatred of America "is not all manufactured," he wrote. "It is rooted in a fact-based narrative, one that North Korea obsessively remembers and the United States blithely forgets." "Over a period of three years or so, we killed off — what — 20 percent of the population," Air Force Gen. Curtis LeMay, head of the Strategic Air Command during the Korean War, told the Office of Air Force History in 1984. Dean Rusk, a supporter of the war and later secretary of state, said the United States bombed "everything that moved in North Korea, every brick standing on top of another." After running low on urban targets, U.S. bombers destroyed hydroelectric and irrigation dams in the later stages of the war, flooding farmland and destroying crops. Historians dispute just how important this bombing really was in making North Korea the country that it is today; some say it was formative in shaping the young nation's history, others that North Korea was already on its way to becoming the hermit kingdom and that its leaders merely exploited the bombing to get there. As might be expected, the Korean War occupies a central place in anti-American propaganda, but the [propaganda] dwells less on the US Air Force's extensive bombing campaign (which is hard to reconcile with the myth of the protective leader) than on village massacres and other isolated outrages. Yet even if the bombing did not cause North Korea's obsessive hatred of America and Americans, it did help to focus it. The effects of the bombing were felt nearly universally, the suffering it caused among the first shared experiences for North Koreans. Unlike the propaganda, which only recounted supposed American crimes, here was a real American crime that everyone could see for themselves, and indeed had likely affected them personally. How could it not be formative? American bombing, to be clear, did not transform North Korea from a nice country into a bad one; the seeds of the country's generations-long fascist rule had already taken root by the early 1950s, and indeed it is worth remembering that the North had launched the war in the first place. But that bombing did end up abetting, however unintentionally, the Kim family project of creating a paranoid, volatile, and oppressive bunker state. You can see this, for example, in Pyongyang, the North Korean capital, which was all but razed by American bombing. As Myers points out, "The destruction of the original city by American bombs enabled the regime to re-design it from scratch as a grand and enduring work of propaganda in its own right." The symbolism of this is haunting: The US, in its ruthless destruction, made it easier for the North Korean leaders to rebuild their shattered city into a physical embodiment of Orwellian dystopia. The blame for the North Korean project still rests fully with those leaders, who knew exactly what they were doing. But it is a reminder that the United States once lent those leaders a helping hand in converting their nation into a fascist holdover. In the rare moments when we do talk about the US bombing of North Korea, it can be easy to get lost in debating its long-term political consequences. But the bombing primarily mattered at the time, and still matters today, not because it was politically counterproductive, but because it was horrific and unjust. THE NUMBER OF INHABITANTS OF PYONGYANG KILLED BY BOMB SPLINTERS, BURNT ALIVE AND SUFFOCATED BY SMOKE IS INCALCULABLE, SINCE NO COMPUTATION IS POSSIBLE. SOME FIFTY THOUSAND INHABITANTS REMAIN IN THE CITY, WHICH BEFORE THE WAR HAD A POPULATION OF FIVE HUNDRED THOUSAND. Even in the English translation from the original Russian, the seeds of North Korea's now famously vituperative and conspiratorial rhetoric are easy to see; there is an odd reference to "Wall Street bosses" supposedly driving the war. But while today's North Korean anti-American rhetoric is so often filled with obvious distortions and lies and thus easy to dismiss, this piece of anti-American rhetoric is chillingly real. That makes the cable jarring to read even beyond the sheer awful suffering it describes. It was a moment when the official North Korean characterization of America, one that we today rightly consider propagandistic nonsense, had a lot of truth to it. 'There is no historical controversy as contentious or long-lasting as the North Korean and Chinese charges of U.S. use of biological weapons during the Korean War. For those who believe the charges to be false — and that includes much of American academia, but not all — they must assume the burden of explaining why the North Koreans or Chinese made up any bogus claims to attack the credibility of U.S. forces. Because they had no reason to do that. It is a historical fact that the United States carpet-bombed and napalmed North Korea, killing nearly 3 million civilians thereby. In other words, massive war crimes are already self-evident, and if there is any mystery, it is how historical amnesia and/or callous disregard for crimes such as those committed by the U.S. and its allies in Korea, or the millions killed by the U.S. in Southeast Asia, can go ignored today. The suppression of the ISC investigation was, as Chaddock points out, at least in part because ISC chair, Sir Joseph Needham, was not shy in mentioning the connections between the US use of BW in Korea and China and Japanese use of biological experimentation and warfare against China during World War II. This was of high sensitivity to the U.S. as they publicly denied that, having made a deal with Shiro Ishii and the Japanese war criminals of Unit 731 to not prosecute them if US scientists from Fort Detrick and the CIA could get Japanese data and samples — of human tissues gathered via vivisection! — and use them for the US’s own secretive BW program in the early years of the Cold War. It's pretty hilarious how they hijacked perhaps a five year in the making 150th celebration and turned it into a finger at the west.